Unlike common rigid bodies, lightweight rigid bodies have special and spectacular motions that are known as free fall, such as fluttering (oscillation from side to side) and tumbling (rotation and sideways drifting). 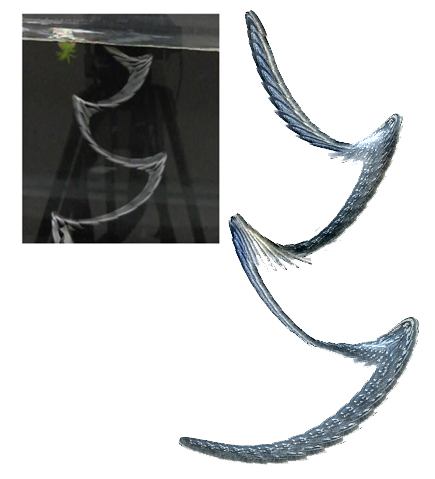 However, computer graphics applications cannot simulate the dynamics of lightweight rigid bodies in various environments realistically and efficiently. In this study, we first analyze the physical characteristics of free-fall motions in quiescent flow and propose a new procedural motion-synthesis method for modeling free-fall motions in interactive environments. Six primitive motions of lightweight rigid bodies are defined in a phase diagram and analyzed separately using a trajectory-search tree and precomputed trajectory database. The global paths of free-fall motions are synthesized on the basis of these primitive motions by using a free-fall motion graph whose edges are connected in the Markov-chain model. Then, our approach integrates external forces (e.g., a wind field) by using an improved noise-based algorithm under different force magnitudes and object release heights. This approach exhibits not only realistic simulation results in various environments but also fast computation to meet real-time requirements. 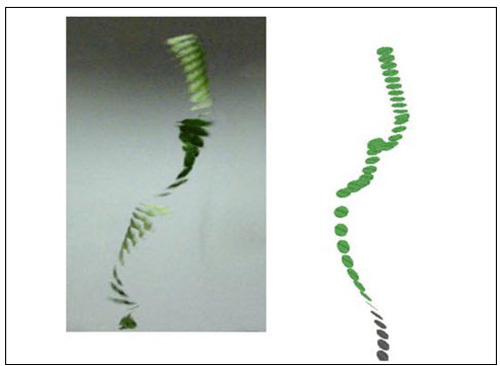 Haoran Xie, Kazunori Miyata, "Real-time simulation of lightweight rigid bodies", The Visual Computer, pp.1-12, 2013.